Nitra is a city in western Slovakia, situated at the foot of Zobor Mountain in the valley of the river Nitra. 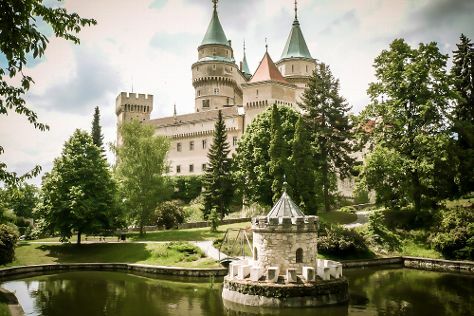 Get out of town with these interesting Nitra side-trips: Cerveny Kamen Castle (in Cerveny Kamen), Banska Stiavnica (Kalvaria, Open-Air Mining Museum (SMM), & more), Banska Bystrica (Slovak National Uprising Square, The Clock Tower, & more), Trencin Castle (in Trencin), Cicmany (in Cicmany), Trnava (St. John the Baptist Cathedral & City Tower), Bojnice (Bojnice Zoo & SNM - Bojnice Castle Museum), Kremnica Town Castle (in Kremnica), Beckov castle (in Beckov), Cachtice Castle (in Cachtice), Piestany (Spas & Wellness & The Colonnade Bridge) and Thermal Spas (in Trencianske Teplice). Next up on the itinerary: explore the historical opulence of Nitra Castle, take in the architecture and atmosphere at Church of St. Michael the Archangel, and appreciate the history behind Prince Pribina Statue. To see traveler tips, photos, and tourist information, read our Nitra trip itinerary builder. The Route module shows you all the different ways you can get to Nitra. In December, plan for daily highs up to 3°C, and evening lows to -1°C. Finish your sightseeing early on the 21st (Wed) to allow enough time to drive back home.